Cardiac calcium scoring is a very effective tool to detect one of the major causes of heart disease, calcium buildup in the arteries. If there's too much buildup, also called plaque, there is less room for blood to flow through the arteries to the heart. In turn, this can lead to heart attacks, heart failure, strokes, arrhythmia and angina. A calcium scoring screening, along with other indicators, presents an overview of an individual's heart health. 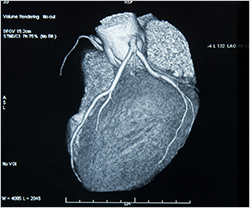 Cardiac calcium scoring is a screening in which medical experts use a computed tomography (CT) scan to detect calcium deposits in coronary arteries. The presence of calcium deposits is directly linked to coronary plaque, which, in turn, is directly connected to the risk of future coronary disease. There is no preparation necessary for a calcium scoring scan, and the entire process only takes about 30 minutes. First, a brief personal and family history is taken, and then a CT scan of the heart and coronary arteries is performed. The scanner takes dozens of images during the fractions of a second between heartbeats. Once completed, cardiologists at Northwest Hospital calculate a total calcium score. That score is then compared to gender- and age-specific patient databases to come up with a final number. The lower the score the better, and a figure of 150 or more indicates an unhealthy build up of calcium deposits. Individuals are then encouraged to discuss the results of the calcium scoring with their own doctors. A plan of action can be tailored to each person's unique needs. That plan can be anything from eating a healthier diet, exercising, regularly checking blood pressure and cholesterol, managing diabetes and/ or taking medications as prescribed. For more information or to schedule a cardiac calcium scoring screening at Northwest Hospital, call 410-601-WELL (9355). The cost of the test is $75 and is typically not covered by insurance.